37 year old Jaelea Chance, of Branson, was arrested on Sunday, May 20, after she was implicated by two others earlier that day. According to affidavits of probable cause, used in filing charges against them, Lori Trueblood, 46, of Galena, and Christopher Riley, 32, of Reeds Spring, were stopped by Stone County Sheriff’s Deputies on Sunday in Reeds Spring. Through a probable cause search of the vehicle, Deputies Owens and Joliff reportedly found several illegal drugs and related paraphernalia. These allegedly included methamphetamine under the passenger seat where Riley was sitting, plus marijuana, a scale, a pipe and three pills, identified in the report as Oxycodone/acetaminophen. Trueblood allegedly told the deputies that she had a pipe on her person that Riley had asked her to hide during the traffic stop. Riley and Trueblood were arrested and booked into the Stone County Jail. Trueblood was charged with one count of possession of a controlled substance and is being held on $25,000 cash bond. Riley has two counts of possession of a controlled substance. He is also being held in lieu of $25,000 cash bond. During their arrest, Trueblood and Riley allegedly mentioned to the officers the address where Riley picked up the pills, a hotel room at the Lakeview Inn in Branson West. Deputies responded to that location and made contact with Jaelea Chance. The law enforcement officers reportedly told her that Trueblood and Riley mentioned her when they were stopped. The deputy then asked Chance if there was anything illegal in the room. She allegedly said her son had a marijuana pipe. After taking the pipe, Deputy Owens reportedly told Chance that the Reeds Spring K9 would be coming to the room. At that time, Chance allegedly said there was methamphetamine in a pack of cigarettes. During the search, the officer allegedly found a pill bottle of Oxycodone/acetaminophen like those found with Riley and Trueblood. Also reported in that same pill bottle were four Alprazolam. Chance was arrested and booked into the Stone County Jail. 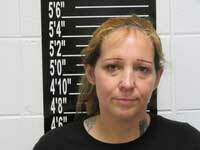 She is charged with possession of a controlled substance and delivery of a controlled substance. This latter charge is a Class C felony. She is being held in lieu of $50,000 bond as of presstime on Tuesday, May 22. Chance also reportedly has an active and extraditable warrant from the state of Oklahoma. She has an additional $100,000 bond on a charge of counterfeiting from that state.